﻿ X264 vs X265: What's the Difference Between X264 and X265? What's Difference Between x264 and x265? Which Is Better? Have you noticed that HD and ultra HD videos gradually take the place of SD videos these days? The fact that X264 and X265 come to compatible with hardware devices turns out to the strongest evidence. For example, since iPhone 6S first supported 4K UHD video recording, Apple initiatively support HEVC (X265) on iOS 10 and macOS High Sierra. Provided that you're able to play both x264 and x265 videos, x264 vs x265, which is better? And what's the difference between x264 vs x265? Scroll down and you'll find the definition of x264 and x265, differences based on quality, file size, bitrate etc., pros and cons, context of use and so on. x264 is a free software library developed by VideoLAN for encoding video streams into the H.264/MPEG-4 AVC format. Usually we confused x264 with H.264, which is not wrong, but not accurate as well. Actually, H.264 is a specification for compressing video, aka MPEG-4 part 10 or AVC; while x264 is a very high quality encoder that produces remarkable quality H.264 compatible video-stream. It is almost exclusively used by all the open source video platforms like ffmpeg, gstreamer, handbrake etc. In short, H264 is a format, and X264 is a software library to create H264 files. And x265 is a free software library and application for encoding video streams into the H.265/MPEG-H HEVC compression format, and is released under the terms of the GNU GPL. From the definition, we got to know x265 is a successor to x264. Similarly, there are also confusion with x265 and H.265, which goes the same with x264 vs H.264. However, in daily life, it's not that exact for x264 vs x265 and H.264 and H.265. That is to say, we usually lumped together H.264 vs H.265 and x264 vs x265 comparison. 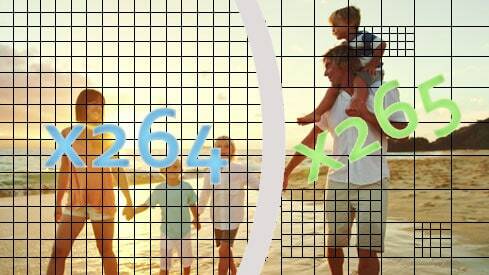 x264 vs x265: What's Difference Between x264 and x265? Introduction: MPEG 4 Part 10 AVC (Introduced in 2004). Specification: Support Up to 4K (4,096×2,304); Supports up to 59.94 fps; 21 profiles ; 17 levels. - Provides best-in-class performance, compression, and features. - Achieves dramatic performance, encoding 4 or more 1080p streams in realtime on a single consumer-level computer. - Gives the best quality, with advanced psychovisual optimizations. - Support features necessary for many different applications, such as TV broadcast, Blu-ray low-latency video applications, and web video. - x264 forms the core of many web video services, such as Youtube, Vimeo, and Hulu. It is widely used by television broadcasters and ISPs. - Led the growth of HD content delivery for Broadcast and Online. Drawbacks: Unrealistic for UHD content delivery due to high bit rate requirements. Frame rate support restricted to 59.94. Introduction: MPEG-H, HEVC, Part 2 (Approved in Jan 2013 ). Specification: Up to 8K UHDTV (8192×4320); -upports up to 300 fps; 3 approved profiles, draft for additional 5 ; 13 levels. - Provides next-generation compression and codec. - Fast and excellent quality. - Completly free and libre software, ensuring freedom for everyone. - Potential to realize UHD, 2K, 4K for Broadcast and Online (OTT). Drawbacks: Requiring more compute power to decode, devices using batteries will run out of power faster and it is expensive to license. 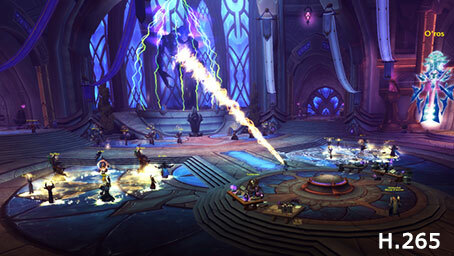 World of Warcraft: Legion alpha | 30fps, 1920x1200 resolution, 33 second video. Ps. I encode this video file with Handbrake H.265 encoder. After the x264 and x265 encoded, I got a H.264 and H.265 video. Then I tried playing the videos side by side. To be frank, I had a very hard time discerning a quality difference between the two videos but from what I saw it seems that the x265 encoded video has a slightly warmer color to it. Regardless of x264 vs x265, which is better - the fact that the filesize is much lower for what essentially looks the same is outstanding. In the comparison of H.264 and H.265, no matter you'd like to encode your videos with which codec, it's quite sure that the h.264 and h.265 would be the ones of now and future. So you may need a H.264 and H.265 encoder to encode video to H.265/HEVC up to 1080P/2160p/4320p, as well as decode and convert H.265 video to H.264, HEVC to MP4 for better compatibility. MacX Video Converter Pro wins the top priority owing to the hardware encoder (Intel QSV) support, Hyper Threading tech and Multiple CPU cores support, delivering up to 5× faster speed than other common x264 x265 encoders. Step 1: Before you start, free download H.264 and H.265 encoder for Windows 10/8/7/XP, or Mac version for Mac computer and launch it. The click "Add Video" to load your target video. Step 2: An Output Profile window pops up instantly, which enables you to encode H.264 and H.265 as output. H.264 codec: Go Mac General Video > MP4 Video (H264). Or choose other MP4/MKV format with H.264 codec. Step 3: Click "Browse" button to select a target folder. Step 4: Hit the "RUN" icon on the lower right corner, you will get your H.264 or H.265 codec video after a break. 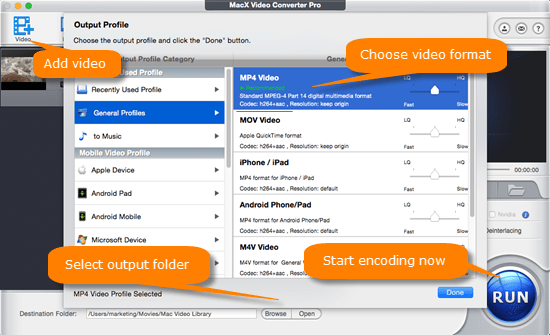 MacX Video Converter Pro can easily convert HEVC H.265 or H.264 from/to AVI, QuickTime MOV, FLV, MP4, H264, 3GP, YouTube, FaceBook, iPhone, iPad, Android etc, and also free download 4K videos from 300 more video sites fast with high quality.